the alarm went off at 5:30 a.m. this morning. 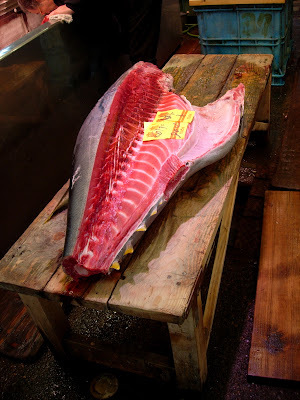 our friend kimberly irion has come to japan to visit us, so we decided to take her to the tsukiji fish market. it's one of the world's largest, handling over 2,000 tons of fish a day. after being nearly run over by every possible vehicle just outside the market (it's kinda busy) we found our way inside and wandered the aisles checking out the fish, some if it so fresh it was still swimming. we did our best to stay out of the way of buyers and sellers, but often caught an abrupt "sumi masen!" from someone on a scooter. sushi breakfast at a nearby shop capped the morning. our day had just begun.